The New Journal travels to Tom Breen’s home town and sees how his family’s lives have been devastated by his murder in Camden Town. AS the sun dips below the picturebook town of Downpatrick, Lorraine Breen knows she should be walking through its grassy hills with her husband Tom. The couple fled the uncertainty and chaos of Belfast many sunsets ago for the escape of County Down. In this scenic retreat, they could often be spotted walking together, taking the country path leading away from the family home and into green meadows that seem to roll on forever. But Lorraine now takes the path alone. This summer it will be six years since Tom was stabbed in the chest in Camden High Street, Camden Town, but the pain for Lorraine Breen and her family never goes away. As an unbreakable couple, Lorraine and Tom dodged the trauma of The Troubles in Northern Ireland and having seen the worst of the divisions, at times first hand, and then witnessed the welcome first signs of the peace process, Lorraine could be forgiven for thinking their enduring love was not meant to be cut short by violence. Yet, here, every day, at her husband’s graveside, she finds herself laying flowers and making sure a candle is always flickering. “He was my man and I loved him with all my heart,” she says. “I will never leave him. I’ve made that promise and I’ll keep that candle burning. When I visited Downpatrick two weekends ago, Tom Breen’s closest relatives, his sons Stephen and Paul, sister Catherine and mother Anna, took me to his last resting place. Looking into the eyes of his loved ones, you can only ever get a glimpse, just a small appreciation of the pain this family has been through over the last half-decade. 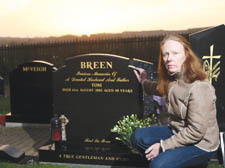 But now, with a murder inquiry unsolved and justice still not served, his relatives want Tom Breen’s killer, or killers, or anybody who might be shielding them, to try and do the same. The message from Downpatrick to Camden Town is clear: Look into our eyes and tell us that you can live with our Tom’s murder. Tom Breen was 50 when he died in the early hours of August 11, 2002. He had been out drinking with his workmate Brian McGarry when they were ambushed by two men near the Elephant’s Head pub. A man armed with a knife slashed at both of them. Mr McGarry was cut but escaped with a minor injury. Tom was not so lucky. His family have been told he put up a fight but Tom was cut to the floor. He was rushed to the Royal Free Hospital but died soon after from what police described as an “unprovoked and brutal” attack. The police investigation has been hit by the misfortune of CCTV cameras pointing the wrong way and Mr McGarry’s apparent patchy memory. He was said to have had hypnosis to clear his mind. While two arrests have been made, no suspects have ever been charged and detectives are still in need of more evidence. A £20,000 reward still stands and nobody at Scotland Yard is happy that a man could apparently commit murder and then simply slip away from one of London’s busiest streets and into the night. “You can’t really move on,” Lorraine, 54, adds. “People say that even if they are never caught they will have to face being judged by God, but that is not enough for me. They need to face a court in this world, in this life. Tom’s death remains the only unsolved killing from a disturbing spate of deaths that hit Camden Town in the summer of 2002: six people died in three months, albeit in unrelated cases. Lorraine has rarely spoken publicly before, let alone allow a journalist into the home she shared with Tom, a house still scattered with memories. There is a carving made by a friend in Tom’s memory hung across the cooker, while his smiling face beams out of photo frames in every room. There is no way he will ever be forgotten. Lorraine says: “I couldn’t go to Camden. I know what the High Street looks like and where it is but it would be too painful to go to where it happened. “Sometimes I don’t know where I have got the strength from to carry on. I still have our two sons but something will always be missing: Tom. Tom had been travelling between Downpatrick and London on a series of building jobs. While others were popping champagne corks on New Year’s Eve, Lorraine took herself off to bed early. “I hardly go out at all now,” she says. “On New Year’s Eve, I just want it all to go away because I’m thinking it’s another year without him and what am I going to do. So I just turn off the TV, turn off the party and go to bed. Christmas can be hard too. We did so much together. We went to football matches together, to see Celtic. The last time I saw him was at a Rod Stewart concert. The first time we met was at the age of 16 in a disco in Belfast. I went back there recently and it’s not there now – it’s a clothes shop. But we met for the first time there and I remember going back to the disco the next week to see if he would be there again and he was. Although from different parts of town, Lorraine and Tom did not let any of the divisions that scarred Belfast at the time stop them being together. “There must be somebody close to the person or people who did this that feels uncomfortable They must know what happened but are staying quiet to protect them. One anonymous letter writer has previously contacted police but did not respond to an appeal for further pointers. The family are willing to meet any new witness who might be worried about talking directly to the detectives and Stephen Breen said he would travel to meet anybody who might help on an anonymous basis. They are also considering raising funds to offer money to anybody who approaches them with confidential information. “It could be a message from somebody through somebody else,” said Lorraine “If they are worried about going through the police, they could get a message to us. This has taken Tom’s life and it has taken my life away as well.